It took me three months, but I succeeded in chronicling every single appearance of Karnilla the Norn Queen. Unfortunately, such an important task shouldn’t have been left up to me, or my dozing editor, because I missed a few along the way. Either I just flat out didn’t have access to the book at the time it came up on the list, or the list I was working off of was incomplete. Regardless, I intend to try and make up for these egregious errors this week. In a tale set far in the past, a young Thor is despondent over the actions of his father Odin. For some reason, Karnilla decided to comfort him. She shows him visions of his future. His days being worshipped by the Vikings of the North, and becoming a figure known all across Midgard, to his heroic exploits with a team of mortals known as The Avengers. 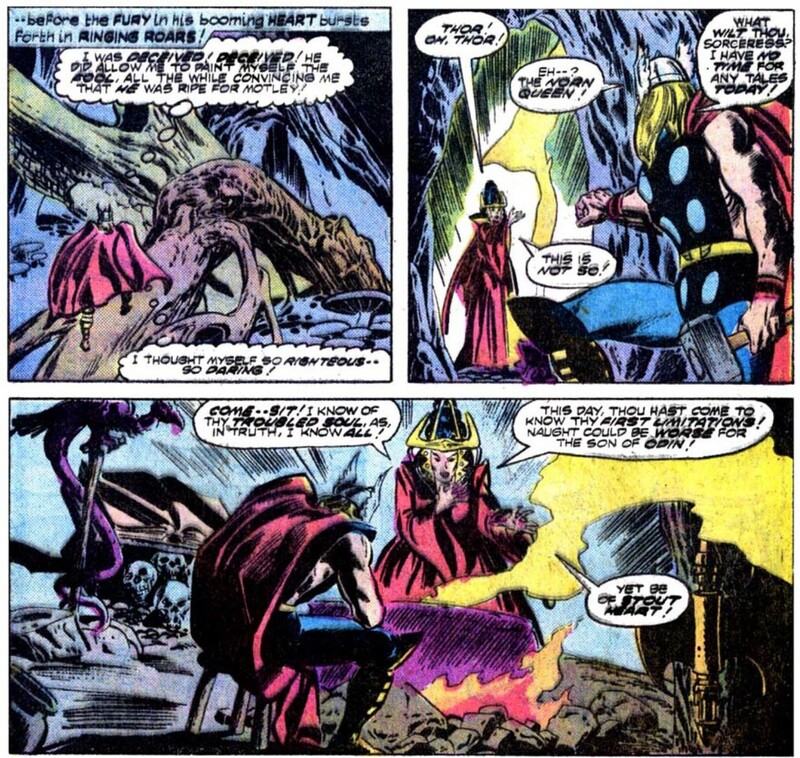 With his spirits sufficiently buoyed, Thor leaves with a renewed sense of purpose. 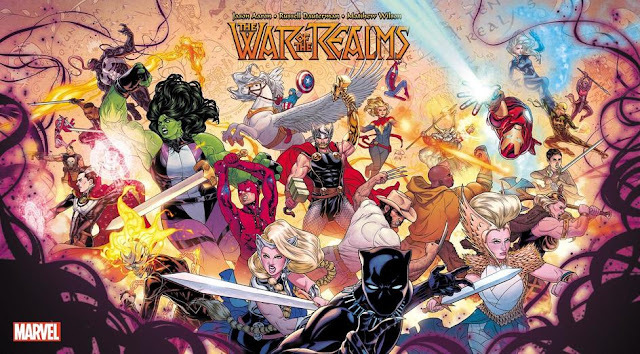 This story seems like a product of the time period in which it was published, instead of the time period predating the beginning of the Thor comic book. 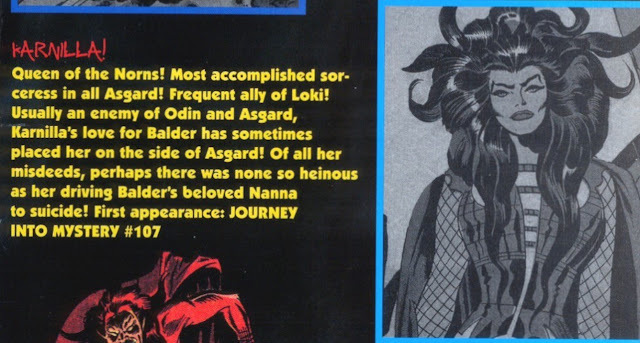 Karnilla had become a frequent ally of Asgard over in the Thor books, so it makes sense she would be helpful here, but really she should be eagerly trying to destroy Thor, as she is in her first appearances. Unless she’s just been wishy-washy about killing Thor over the milleniums, which is just not cool. 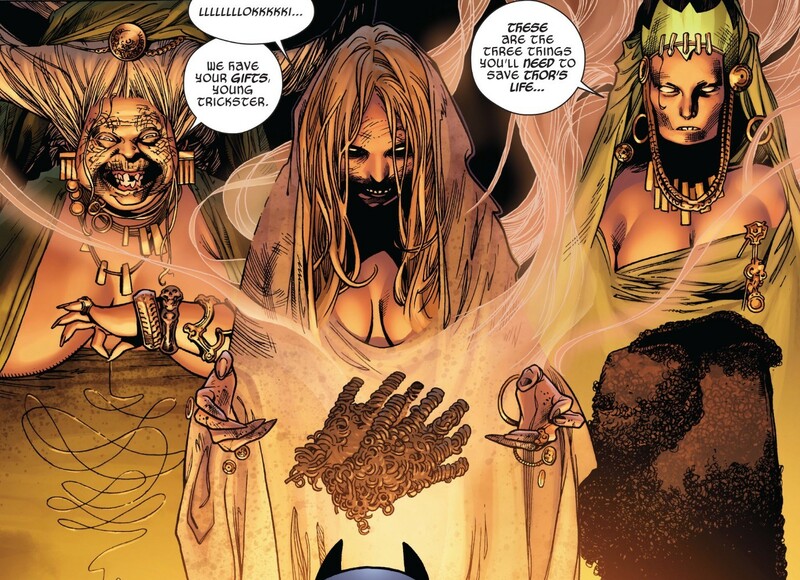 The Enchantress pays a visit to Karnilla, who is in the middle of some spell casting. 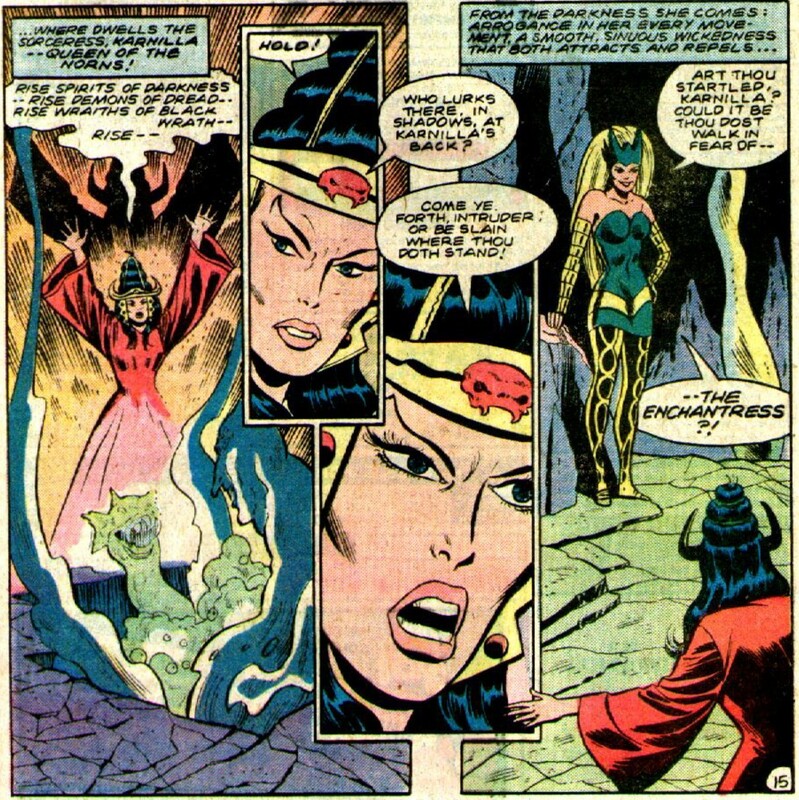 After some boasting on both sides, Amora gets to the purpose of her visit. 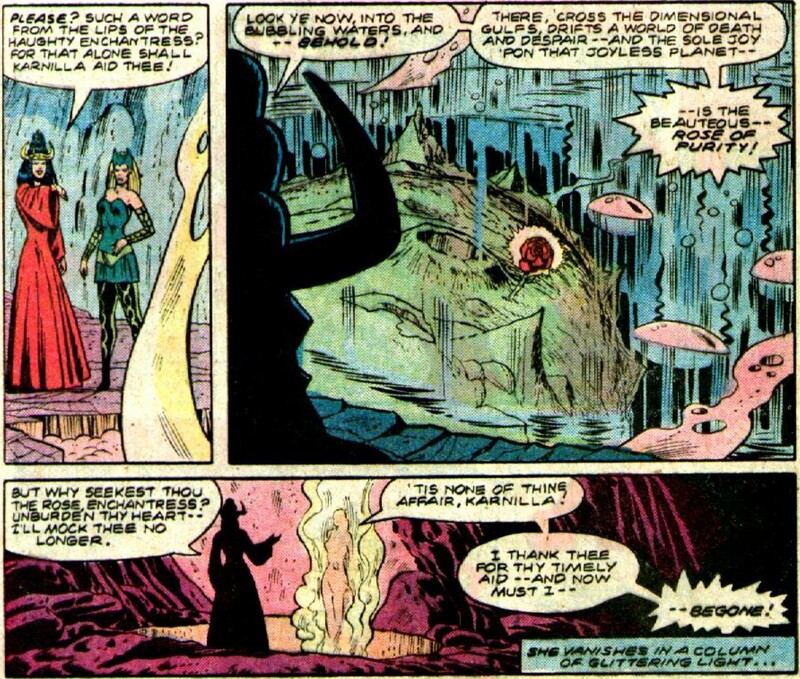 Amora seeks the Rose of Purity, currently in Karnilla’s possession. When asked why, Amora refuses to divulge her reasons, so Karnilla calls her a “wretched tart” and tells her to bounce on out of there. Amora lets down her guard, and sincerely asks her “please.” Moved by the sincerity, Karnilla shows her where the rose is. She makes one final attempt to find out what Amora needs it for, free of mocking, but Amora leaves in a hurry. 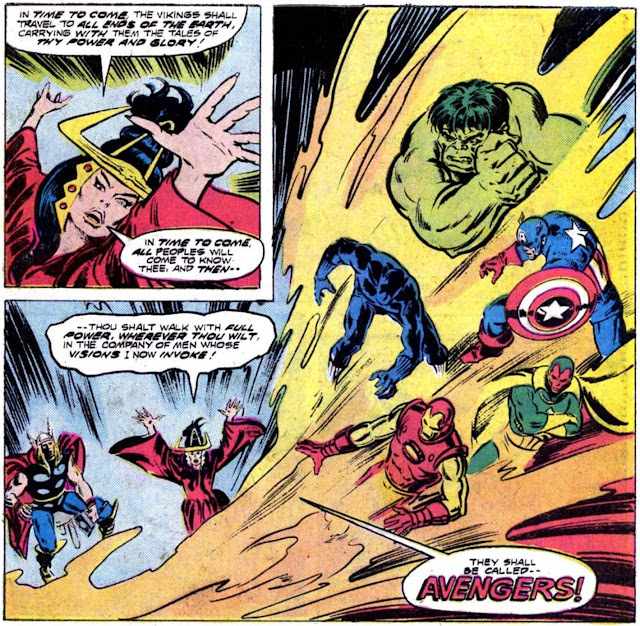 It’s cool to see that Buscema’s model for the character was being used as the standard at the time. I don’t know why, that should be automatic. I guess I’m just used to Kirby drawing her differently every single time he used her. Whatever, carry on. The Wrecker once again remembers back to when he initially gained his powers, at the hands of Karnilla. For a big dumb thug, the Wrecker likes to take a moment to reflect on his past quite a bit. You’d think that type of self-reflection would lead to more lifestyle changes. On that note, my wife believes that if she ever got super powers, she would definitely use them for personal gain. I tend to agree with that thought process. I most definitely would become a villain. Who’s to stop me? I would be invincible. This is nothing more than a short description of Karnilla, on a page detailing Thor’s greatest foes. One list considered this to be a Karnilla appearance, and I suppose it is her disguised as the Old Crone, so I guess it counts. That’s it! Finally, I am done. I love you Karnilla. Turn the lights off when you leave.